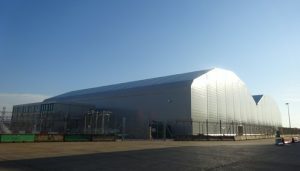 easyJet, Europe’s leading airline, has today opened a new purpose built 2 bay hangar facility at London Gatwick Airport. The innovative hangar design, which is over 5,400 square metres and provides superior thermal properties reducing energy costs, was selected from market leader RUBB buildings. Building commenced in November 2015 and has included the installation of a sub-station and gas plant, pulling power cables from one side of LGW to the other, fitting 8,700m2 of PVC membrane and laying 100 metres of drainage. 780 tonnes of concrete were used along with 280 tonnes of steel and 8,000 nuts, bolts and washers. To complete the build two sets of ‘Megadoor’ hangar doors were fitted to allow access to the two A319 and A320 bay facility. The hangar is complimented by a 550sqm external logistics and office building. In addition to the hangar build itself, a tender was run to select a suitable partner to provide the maintenance services. easyJet’s existing partner in Milan Malpensa and Berlin Schoenefeld, Lufthansa Technik, were selected and a ground breaking 5 year contract has been signed which sees Lufthansa Technik opening their first UK hangar based operation. The on site team will deliver two inputs every night, seven days a week and provide AOG hangar support as required. easyJet will also have increased oversight and management of all aircraft maintenance activity at London Gatwick through the recruitment of an onsite team which is headed up by Kevin Creed. Kevin has taken up the position of easyJet’s London Gatwick maintenance manager after more than 15 years in various roles at easyJet, latterly in the airlines Maintenance Operations Team at its head office in London Luton.